Hidato (Hebrew: חידאתו‎, originating from the Hebrew word Hida = Riddle) is a logic puzzle game invented by Dr. Gyora Benedek, an Israeli mathematician. 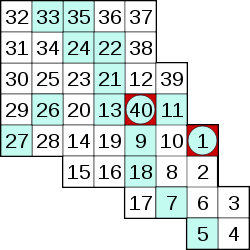 The goal of Hidato is to fill the grid with consecutive numbers that connect horizontally, vertically, or diagonally. Numbrix puzzles, created by Marilyn vos Savant, are similar to Hidato except that diagonal moves are not allowed. Jadium puzzles (formerly Snakepit puzzles), created by Jeff Marchant, are a more difficult version of Numbrix with fewer given numbers and have appeared on the Parade magazine web site regularly since 2014. The names Numbrix and Hidato are registered trademarks. Some publishers use different names for this puzzle such as Number Snake. In Hidato, a grid of cells is given. It is usually square-shaped, like Sudoku or Kakuro, but it can also include irregular shaped grids like hearts, skulls, and so forth. It can have inner holes (like a disc), but it has to be made of only one piece.